Chloe’s 100 days was something we really enjoyed working on. 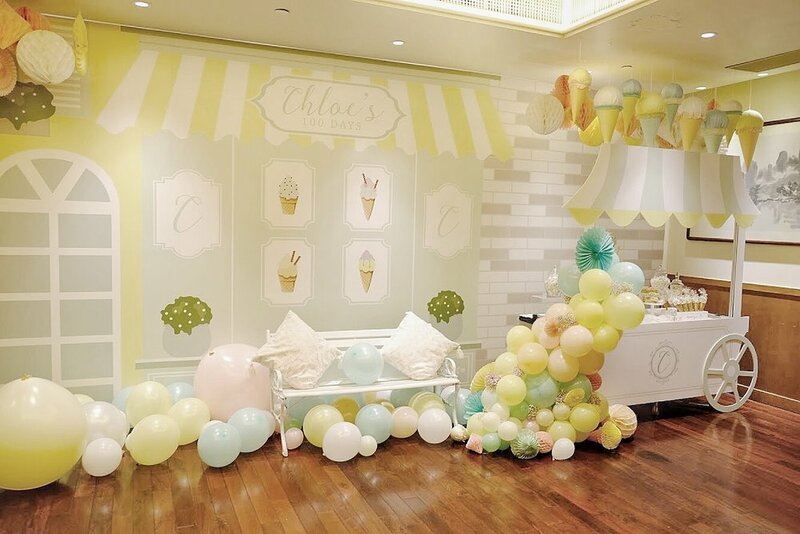 Chloe’s auntie, Rosetta Heung, founder and boss lady over at Sweet Spot Cakes, wanted us to create an ice cream themed party with a pale yellow and mint green palette. We went to town for this one. We made a wall-to-wall custom designed foamboard backdrop portraying a quaint French street complete with a lovely apartment building façade, a little coffee shop and a brick wall. We made (yes, made) a vintage looking ice cream cart complete with this huge macaron balloon garland spilling out of it with pastel rainbow-colored baby’s breath inserts. Hanging on top were an assortment of pastel colored lanterns, honeycombs, paper wheels, AND handmade 3D ice cream cones. We completed the look with a white bench for photos and Rosetta did her magic with the beautiful desserts showcased on the ice cream cart table. This was definitely one for the books and we were happy to be part of it!